If you didn't know, I recently acquired a large bottle of Mexican vanilla. I may not have mentioned it I'm pretty low key about these things :). Even though I have a 1 litre bottle to work through, I think I'm only going to use it when vanilla is the feature. I will also be making specific reference to it's use. I'm sure the recipes will still be good with domestic vanilla (providing it was good to start) but everything I say about the flavour may not be entirely the same. 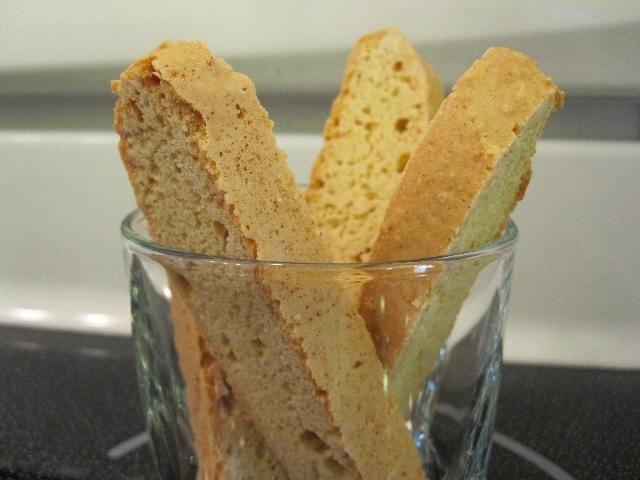 These biscotti are the first recipe paired with the vanilla. From the start I wasn't exactly sure what kind of recipe to choose. I had been thinking cupcakes or something like that, but for some reason became enamoured with the idea of biscotti. 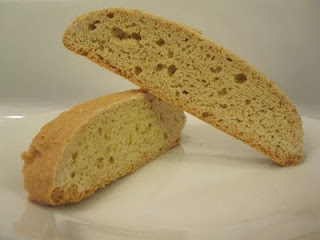 Plain old vanilla biscotti. And although I had bookmarked a biscotti recipe entitled “Vanilla” it was American style, which I did not want. American biscotti is softer due to the added fats, I wanted the hard, crunchy, coffee durable Italian biscotti that we all know and love :). The American biscotti recipe was my inspiration but this recipe is based on the coconut biscotti I made previously. I figured I would be okay to simply remove the coconut, since a little research revealed that the recipe was proportionately close to “biscotti ratio.” Let's just say that I couldn't have been more wrong on that one. After brining and mixing all the ingredients together I had more of a soup than biscotti dough. I had to add a further half cup of flour before the dough came together into something recognizable. I should have known that my problems weren't going to end there, but at least now there was a dough to bake and perhaps be edible (mostly). I had remembered being warned in the original coconut recipe that the dough would be sticky but found that it was not. Oh how things changed. I imagine the only thing comparable to scooping out and then shaping this biscotti dough is mud wrestling an octopus with super glue laced suction cups. I eventually managed to beat the dough into submission, resembling something kin to the shape of biscotti (though a little larger than I wanted). But whatever, it felt like a victory, it was in the oven after all :). I'm going to break here to tell you a little something about Mexican vanilla. I mean how much different/better could it possibly be? It turns out a lot. As I was prepping the ingredients I took out my bottle of domestic vanilla and gave it a little sniff “okay, yeah, that's what vanilla smells like” I said. I then opened my lovely, brand new bottle of Mexican vanilla and proceeded to be blown away. The smell is completely different. Somewhere underneath the rich, floural, sweet, creamy, scent of Mexican vanilla lies the notes of the domestic kind. The difference is astounding. I told anyone that would listen (all in my house) and then had them smell the difference for themselves. They were amazed as well. I think we all received vanilla sniffing headaches from taking numerous long inhales of Mexican vanilla (can I say that? Is it legal? I think I hear sirens :) ). And now back to your regularly scheduled recipe; already in progress. After the first bake had finished I knew that everything would be okay. It was turning out exactly as biscotti should. My nerves were definitely calmer as the second bake began. The smell of the house, you can imagine, was heaven. The biscotti was exactly as I had hoped. They were very hard and crunchy, but not dry dry; just dry like a proper biscotti should be (in my opinion). Honestly, the only way to describe the flavour is to say it tasted exactly as the vanilla smelled, if that makes any sense. It was rich and creamy with a light floural fruitiness I dunno if that makes sense either, so lets just say it was awesome. I'm not sure it would be the same if I used domestic vanilla. It may still have blown my mind or perhaps I would just say “tastes like vanilla.” Regardless, if you have it, Mexican vanilla is the way to go. Sure the biscotti ended up being more trouble than I thought it would be, but it was completely worth it. They had great flavour that truly highlighted the uniqueness of the vanilla. Despite my issues shaping the dough my biggest problem with this recipe is my new obsession with Mexican vanilla (are you sick of reading that yet?). Speaking of which, I should wrap this up, I'm going to be late for my VSA meeting. Vanilla Sniffers Anonymous :). Attach dough hooks to mixer and kneed dough for 30 seconds. It will not form a ball like a yeast dough. Bake for 45 to 55 minutes or until edges become golden brown (this took me 52 minutes). With a sharp serrated knife, cut cookies approximately 3/4 inch apart (on a bias if you choose, I cut them straight this time). Place each cookie upright on cookie sheet, roughly 1 inch apart. Remove from oven and allow to cool on cookie sheet for 1 minute before moving cookies to rack to cool completely.